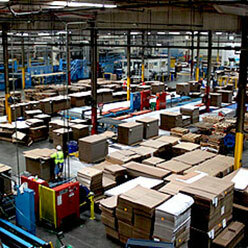 Over 35 years of success, Corru-Kraft has set itself at the top of the market. The three plants are supported by a state-of-the art laboratory and testing facility, which is staffed by experts in the paper and corrugating industry. Incoming materials are inspected regularly for compliance to strict quality standards. Paper suppliers include Longview Fibre, Boise-Cascade, Simpson, Bio-Pappel, RockTenn, and International Paper. Corru-Kraft is registered ANSI/ISO/ASQ Q9001-2015 Standard to better meet the needs of the independent sheet plants. Well-documented processes and procedures ensure that sheet orders meet or exceed all of our Customers requirements, and are delivered defect free and on-time. Corru-Kraft offers many innovative product options designed to help solve your most challenging packaging needs. As well as using high quality virgin kraft and recycled liners, Corru-Kraft’s product offering ranges from: special coated and uncoated bleached white grades, smooth printing surfaces such as MHI Paser® 60G Singlefacer and BHS Band-Leader dual cartridge. Other options include high performance ECT grades that are cost effective alternatives to traditional grades, SFI certified products and 100% recycled grades that help the environment by minimizing waste.